Cinematography, from the Greek words kine (movement) and graphos (writing), is the art and craft of creating and filming images for motion pictures. Using a video camera to take video images—images that are made and stored electronically rather than on physical film—is usually called videography. However, with motion pictures increasingly being shot and stored by video (because the video process is much less expensive than shooting on film stock, which is much more expensive than videotape, especially when one incorporates expensive development lab costs), and then later transferred to film for projection in movie houses, the two different mediums of recording moving images are beginning to merge. Cinematography is an art form unique to motion pictures. Although the exposing of images on light-sensitive elements dates back to the early 1800s, motion pictures demanded a new form of photography and new aesthetic techniques. Cinematography does have many things in common with still photography: How different lenses perform and their effects on the resultant image; the differences in film stocks and the results on the consequent image, and the effects of different development on the image; framing of scenes and images; effects of different distances from camera to subject; different effects whether the camera is positioned low, mid-height, or high; how the scene or subject is lit and the effects of this on the image; etc. But cinematography goes well beyond still photography in that the motion picture (cinema) image, as seen by the eye, is a moving one, and cinema is filmed over a period of time. The basic unit of still photography is the single image, but, as film theoretician Pierre Rouve has noted, motion cannot be depicted in a single image. The basic unit of cinema, however, is two still pictures side by side on the strip of film plus the dynamic time movement between those two images. Because cinema is made up of moving images, numerous additional issues or choices emerge in cinematography, beyond those of still photography. For instance, camera movement, consistency of lens focal length, zoom, and complexity of the shot. In fact, all the possible motions of the camera and lens can be combined within a single shot for a complex result. One such interesting result can be obtained by dollying out while zooming in (or dollying in while zooming out) during a shot, so that the size of the things in the resulting image stays the same, but the perspective relationships change in what is called a "Hitchcock zoom." Additional choices in cinematography result from the fact that a motion picture image depicts motion over a period of time. In still photography the picture is taken in an instant, so there is only one choice: when to trip the shutter. But in cinematography a choice has to be made as to when to start the camera and another about when to stop it. For scenes that the cinematographer devises or creates, those scenes have to be made to endure through, and possibly change, over the course of a shot; in still photography a scene needs to be made to endure only for the instant of the photograph. In cinematography, scenes have to be lit so that the lighting produces the desired effect for the duration of the scene and whatever motion occurs in it, and not just for a fixed instant as is needed in still photography. Since the film is moving through the camera, the speed of the camera motor (or hand crank in earlier cinematography) is important—speeding up the camera results in slow motion on the screen, while slowing down the camera results in faster screen action. Thomas Edison invented the motion picture camera, and the first cinematographer was the person who first used Edison's device—possibly Edison himself—to make the first motion picture shot. Roundhay Garden Scene directed by Louis Le Prince, in 1888. 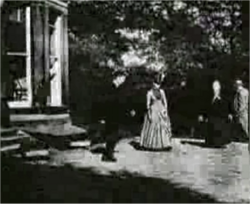 The first professional cinematography may go back to what is supposed to have been the world's first film, Roundhay Garden Scene, featuring dancers. It was a sequence directed by Louis Le Prince, French inventor and showman, on October 14, 1888, in Leeds, Yorkshire. This groundbreaking event happened seven years before the Lumière Brothers' Sortie de l'usine Lumière à Lyon became the world's first commercial exploitation of cinematography, in Paris, France. That European city soon became the motion picture capital of the world until about 1919. In the infancy of motion pictures, the cinematographer was usually also the director and the camera operator. As the art form and technology evolved, a separation between director and camera operator emerged. With the advent of artificial lighting and faster (more light sensitive) film stocks, in addition to technological advancements in optics and various techniques such as color film and wider aspect ratios, the technical aspects of cinematography necessitated a specialist in that area. Some directors, however, are still noted for operating their own camera and shooting some or all of their scenes themselves—the late Stanley Kubrick was one such example. In 1919, in Hollywood, the new motion picture capital of the world, one of the first (and still existing) trade societies was formed: the American Society of Cinematographers (ASC), which stood to recognize the cinematographer's contribution to the art and science of motion picture making. Similar trade associations have been established in other countries, too. The ASC is deeply involved in establishing standards for cinematography and cinematographers, in advancing the art and craft of cinematography, and in recognizing the work of outstanding cinematographers. It also publishes a magazine, American Cinematographer, maintains a website (http://www.theasc.com/), and produces a standard manual of cinematography, The American Cinematographer Manual. In the film industry, the cinematographer is responsible for the technical aspects of the images (lighting, lens choices, composition, exposure, filtration, film selection), but works closely with the director to ensure that the artistic aesthetics are supporting the director's vision of the story being told. The cinematographers are the heads of camera crews, grips (or stagehands), and lighting crews (the electricians and their assistants) on a set, and for this reason they are often called the director of photography or DP. Directors of photography make many creative and interpretive decisions during the course of their work, from pre-production to post-production, all of which affect the overall feel and look of the motion picture. Many of these decisions are similar to what a photographer needs to note when taking a picture: the cinematographer controls the film choice itself (from a range of available stocks with varying sensitivities to light and color), the selection of lens focal lengths, aperture exposure and focus. Cinematography, however, has a temporal aspect (see persistence of vision), unlike still photography, which is purely a single still image. It is also bulkier and more strenuous to deal with movie cameras, and it involves a more complex array of choices. As such, a cinematographer often needs to work co-operatively with more people than does a photographer, who could frequently function as a single person. As a result, the cinematographer's job also includes personnel management and logistical organization. Some cinematographers become very well known for their distinctive styles and abilities, so much so that they begin to rank almost as high as film directors in their influence and renown, and particular cinematographers and directors often become associated with each other. Some of the many important and noted cinematographers have been James Wong Howe, Boris Kaufman, Gregg Toland, Léonce-Henri Burel, Robert Surtees, Raoul Coutard, Michael Ballhaus, Conrad L. Hall, Vilmos Zsigmond, László Kovács, Michael Chapman, Gordon Willis, Néstor Almendros, Vittorio Storaro, Sven Nykvist, Owen Roizman, and Ernest Dickerson. No women's names appear there and professional cinematography at this high level has been almost entirely done by men, although there are a very few women in the field; Leni Riefenstahl, for one noted example, was an extremely capable and accomplished cinematographer. Numerous things contribute to and are necessary for the art and craft of cinematography. Similar to still photography, cinematography utilizes rolls of film, whereas still photography can use either rolls or single sheets (or even glass plates). Advancements in film emulsion and grain structure have led to a wide range of film stocks available to cinematographers. The selection of a film stock is one of the first decisions a director of photography must make during any film production. These stocks include black and white or color, and negative or reversal film; negative film creates a negative when developed (which must then be printed on negative stock to produce a positive) and reversal film which, when developed, creates a positive image. The next important choice is film speed, meaning varying sensitivity to light, and both black and white and color films are available in a wide variety of film speeds. So-called low speed or slow films require more light to be exposed properly, while high speed films require much less light for proper exposure. (In America, film speed is usually expressed in an ASA number, and in Europe in a DIN number—in both cases, the larger the number the faster the film.) Generally speaking, slower films produce sharper and more fine grained images, while faster films have larger grain size and less sharpness. Different makes and types of film each have subtle differences in their image qualities, including differences in saturation, contrast, and image tone, and these differences are used by knowledgeable and experienced cinematographers to produce the on-screen effect they desire. Aside from the film gauge selection, cinematographers have a choice of film gauge—8 mm (amateur), 16 mm (semi-professional), 35 mm (professional) and 65 mm (epic photography, rarely used except in special event venues). Advancements and adjustments to nearly all gauges of film created the "super" variety wherein the area of the film used to capture a single frame of an image is expanded, although the physical gauge of the film remains the same. Super 8 mm, Super 16 mm and Super 35 mm are all formats that utilize more of the overall film area for the image than their "regular" non-super counterparts. The larger the film gauge, the higher the overall image resolution clarity and technical quality. In the realm of digital imaging, film stocks are no longer applicable, but the cameras themselves feature image adjustment capabilities that go far beyond those of one particular film stock. The cameras can be adjusted to capture more or less color sensitivity, more or less image contrast, be more or less sensitive to light and so forth. One camera can achieve all the various looks of different film emulsions, although it is heavily argued as to which method of capturing an image is the "best" method. It should be mentioned that the digital methods of image adjustments (ISO, contrast, etc.) are executed by estimating the same adjustments that would take place if actual film were in use and are thus vulnerable to the particular camera's sensor designer's perceptions of various film stocks and image adjustment parameters. Laboratory work can also offer a considerable variance in the image produced. By such means as controlling the temperature, using different developing chemicals, diluting the developer differently, varying the time in which the film is treated in the development chemicals, or by skipping or altering certain chemical processes (or partially skipping them), cinematographers can achieve very different looks from a single film stock in the laboratory. Filters, such as diffusion filters or color-effect filters, are also widely used to enhance mood or dramatic effects. Most photographic filters are made up of two pieces of optical glass, glued together, with some form of image or light manipulation material between the glass. In the case of color filters, there is often a translucent color medium pressed between two planes of optical glass. Color filters work by blocking out certain color wavelengths of light from reaching the film. With color film, this works very intuitively wherein a blue filter will cut down on the passage of red, orange, and yellow light and create a blue tint on the film. In black and white photography, color filters are used somewhat counter intuitively; for instance a yellow filter, which cuts down on blue wavelengths of light, can be used to darken a daylight sky (by eliminating blue light from hitting the film, thus greatly underexposing the mostly blue sky), while not biasing most human flesh tone. Another filter, called a fog filter, produces an overall effect as if the scene were somewhat fog draped. Certain other devices are also called filters, but produce an optical effect, such as a star filter, a kaleidoscope-type filter, and numerous others. Some cinematographers have become well known for their innovative use of filters. Filters can be used in front of the lens or, in some cases, behind the lens for different effects. As in the human eye, the lens focuses rays of light to form an image. Although they all make images, lenses vary a great deal in their characteristics, their cost, their uses, and the results they can produce. Good photographers, both still photographers and cinematographers, learn a great deal about what different lenses are available, what characteristics each lens has, and what results it can produce on the film, whether it is still camera film or motion picture film. The camera and its lens does what the human eye does: It creates perspective and spatial relations with the rest of the world. However, unlike one's eye, a cinematographer can select different lenses for different purposes. Variation in focal length is one of the chief benefits of such an advantage. Cinematographers can choose between a range of wide angle lenses, "normal" lenses, and telephoto lenses, as well as macro lenses and other special effect lens systems such as borescope lenses. Wide-angle lenses have short focal lengths and make spatial distances more obvious, as well as showing a wider scene (a wider angle of vision) from any given camera position. A person in the distance is shown as much smaller while someone in the front will loom large. On the other hand, telephoto lenses show a narrower scene (a narrower angle of vision) and reduce such exaggerations, depicting far-off objects as seemingly close together and flattening perspective. A Zoom lens allows a camera operator to change the focal length within a shot or quickly between setups for shots. Prime lenses (i.e. lenses of fixed focal length) usually offer greater optical quality and are usually "faster" (having larger maximum aperture openings, making them usable in less light) than zoom lenses, moreover they are usually considerably less expensive to buy or rent than zoom lenses. Most older movies were shot with prime lenses because high quality zoom lenses had not then been invented or made available. Certain scenes or even types of modern film making, however, require the use of zooms for speed of setup or ease of use, as well as shots involving a zoom move. Focal length also affects the depth of field of a scene—that is, how much the background, mid-ground and foreground will be rendered in "acceptable focus" (only one exact plane of the image is in precise focus) on the film or video target. Depth of field (not to be confused with depth of focus) is determined by the aperture size and the focal distance. A large or deep depth of field is generated with a very small iris aperture and focusing on a point in the distance, whereas a shallow depth of field will be achieved with a large (open) iris aperture and focusing closer to the lens. Depth of field is also governed by the format size. 70 mm film has the least depth of field for the same focal length lens than does 35 mm. 16 mm has even more and most digital video cameras have more depth of field than 16 mm. As videographers try to emulate the look of 35 mm film with digital cameras, this is one issue of frustration—excessive depth of field with digital cameras and using additional optical devices to reduce that depth of field. In Citizen Kane, cinematographer Gregg Toland used tighter apertures to create very large depth of field in the scenes, often rendering every detail of the foreground and background of the sets in sharp focus. This practice is known as deep focus. Deep focus became a popular cinematographic device from the 1940s onwards in Hollywood. Today, the trend is for more shallow focus. To change the plane of focus from one object or character to another within a shot is commonly known as a "rack focus." The aspect ratio of an image is the ratio of its width to its height. Beginning in the 1910s, motion pictures settled on a ratio of four to three (four units wide to three units high). Often written as 4:3, this ratio may be reduced to 1.33:1 and this aspect ratio is commonly known as 1.33. The introduction of sound-on-film narrowed the aspect ratio briefly, before the Academy ratio of 1.37 was introduced in 1932 by means of thickening the frame line. For years, cinematographers were limited to this shape of image, but in the 1950s, thanks to the unanticipated popularity of Cinerama, widescreen ratios were introduced in an effort to pull audiences back into the theater and away from their home television sets. These new widescreen aspect ratios granted cinematographers a wider frame within which to compose their images. Many different proprietary photographic systems were invented and utilized in the 1950s to create widescreen movies, but one dominates today: the anamorphic process, which uses special lenses that optically squeeze the image to photograph twice the horizontal area to the same size vertical as standard "spherical" lenses; the projector is also equipped with an anamorphic lens that "unsqueezes" the image in projection, spreading it out wide. The first commonly used anamorphic widescreen format was CinemaScope, which used a 2.35:1 aspect ratio, although it was originally 2.55:1. CinemaScope was used from 1953 to 1967, but due to technical flaws in the design and its ownership by Fox, several third-party companies, led by Panavision's technical improvements in the 1950s, now dominate the anamorphic cine lens market. Changes to SMPTE (Society of Motion Picture and Television Engineers) projection standards altered the projected ratio from 2.35:1 to 2.39:1 in 1970, although this did not change anything regarding the photographic anamorphic standards; all changes in respect to the aspect ratio of anamorphic 35 mm photography are specifically correlative to camera or projector gate sizes (the size of the "hole" in the camera or projector that the film lies against and that controls how much of the film frame is actually exposed by the camera or projected by the projector), not the optical system. After the "widescreen wars" of the 1950's, the motion-picture industry settled into 1.85:1 (which is a cropped version of 1.37:1) as a standard for theatrical projection in the United States and the United Kingdom. Europe and Asia opted for 1.66:1 at first, although 1.85:1 has largely permeated these markets in recent decades. Certain "epic" or adventure movies utilized the anamorphic 2.39:1. In the 1990's, with the advent of high-definition video, television engineers created the 1.78:1 (16:9) ratio as a mathematical compromise between the theatrical standard of 1.85:1 and television's 1.33:1, as it was not physically possible to safely create a television tube with a width of 1.85:1. Until that point, nothing had ever been originated in 1.78:1. Today, this is a standard for high-definition video and for widescreen television. Perhaps the single most important aspect of cinematography is lighting. Light is necessary to create an image exposure on a frame of film or on a digital target (CCD, etc). The art of lighting for cinematography goes far beyond basic exposure, however, into the essence of visual storytelling. Lighting contributes considerably to the emotional response an audience has watching a motion picture. The control of light quality, color, direction, and intensity is a major factor in the art and science of cinematography, so much so that the term "Lighting Cameraman" was sometimes used for what is now called a Director of Photography. One aspect of cinematography that strongly separates it from still photography is the ability to move the camera during a given shot. The camera represents the audience's viewpoint or perspective, thus camera placement and movement plays a considerable role in the emotional language of film images and the audience's emotional reaction to the action on the screen. From the most basic movements of panning (horizontal shift in viewpoint from a fixed position; like turning your head side-to-side) and tilting (vertical shift in viewpoint from a fixed position; like tipping your head back to look at the sky or dropping your head down to look at the ground) to dollying (placing the camera on a moving platform to shift it from one location to another on a horizontal plane) and craning (moving the camera in a vertical position; being able to lift it off the ground as well as swing it side-to-side from a fixed base position) and a combination of all of the above. Motion picture cameras have been mounted to nearly every imaginable form of transportation, including cars, bicycles, wheelchairs, baby carriages, roller skates, boats, helicopters, airplanes, trains, submarines, and others. At least one cinematographer has used old and thus now-inexpensive wind-up 35mm professional cameras as disposable units, turning them on and then throwing them over a cliff so they would film while falling, in order to simulate the viewing experience of a person who fell over a cliff, then rescuing the exposed film from the damaged camera when it landed. Most cameras can also be hand held, that is the camera operator literally holds the camera in his or her hands and moves from one position to another while filming the action. Personal stabilizing platforms came into existence in the late 1970s through the Garret Brown's invention known as the Steadicam. The Steadicam is a body harness and stabilization arm that connects to the camera which allows the operator to move naturally while completely isolating the movements of their body from the movements of the camera. After the Steadicam patent expired in the early 1990s, many other companies began manufacturing their concept of the personal camera stabilizer. The Steadicam allows near-unrestricted movement of the camera in any way that the camera operator can succeed in moving it, into and out of doors, rooms, enclosures, etc., and up and down stairs, etc., with the resulting image appearing completely steady and flowing smoothly on the screen. The first special effects in the cinema were created while the film was being shot. These came to be known as "in-camera" effects. Later, optical and digital effects were developed so that editors and visual effects artists could more tightly control the process by manipulating the film in post-production. Today the art and technology of creating such post-production special effects is very highly advanced, so that things that were impossible a few years ago have now become routine. For examples of many in-camera special effects, see the work of early filmmaker Georges Méliès. Motion picture images are presented to an audience at a constant speed. In the theater, it is 24 frames per second; in NTSC (US) Television it is 30 frames per second (29.97 to be exact); in PAL (Europe) television it is 25 frames per second. This speed of presentation does not vary. However, by varying the speed at which the image is captured, various effects can be created knowing that the faster or slower recorded image will be played at a constant speed. For instance, time-lapse photography is created by exposing an image at an extremely slow rate. If a cinematographer sets a camera to expose one frame every minute for four hours, and then that footage is projected at 24 frames per second, the event that took four hours to record will now take 10 seconds to present (1 frame per minute for 4 hours equals 240 frames, projected at 24 frames per second equals 10 seconds). This compresses the event that took place in four hours into just 10 seconds. At this speed, one can present the events of a whole day (24 hours) in just one minute; this technique is often used to show the opening of a flower bud or other slow-occurring natural process. The inverse of this is that if an image is captured at speeds above that at which they will be presented, the effect is to greatly slow down (slow motion) the image. If a cinematographer shoots a person diving into a pool at 96 frames per second, and that image is presented back at 24 frames per second, it will take 4 times as long to watch the dive as it did for it to actually happen. In motion pictures the manipulation of time and space is a considerable contributing factor to the narrative storytelling tools. Film editing plays a much stronger role in this manipulation, but frame rate selection in the photography of the original action is also a contributing factor to altering time. Traditionally the term "cinematography" referred to working with motion-picture film emulsion, but it is now largely synonymous with videography and digital video due to the popularity of digital cinema. ↑ Hora, John. The American Cinematographer Manual, 9th Edition. Braudy, Leo and Marshall Cohen, eds., 2004. Film Theory and Criticism: Introductory Readings. New York: Oxford University Press. Cousins, Mark, 2004. The Story of Film. New York: Thunder’s Mouth Press. Cubitt, Sean, 2004. The Cinema Effect. Cambridge, MA: MIT Press. Enticknap, Leo Douglas Graham, 2005. Moving Image Technology: From Zoetrope to Digital. London & New York: Wallflower Press. Fullerton, John, Ed., 2004. Screen Culture: History and Textuality. Stockholm Studies in Cinema. London: John Libbey. Hayward, Susan, 2006. Cinema Studies: The Key Concepts. London & New York: Routledge. LoBrutto, Vincent; foreword by Jan Harlan, 2005. Becoming Film Literate: The Art and Craft of Motion Pictures. Westport, Conn.: Praeger Publishers. Malkiewicz, Kris, and M. David Mullen; line drawings by Jim Fletcher, 2005. Cinematography: A Guide for Filmmakers and Film Teachers. 3rd ed., rev. Fireside ed. New York: Simon & Schuster. McKernan, Brian, 2005. Digital cinema: The Revolution in Cinematography, Postproduction, and Distribution. New York: McGraw-Hill. Raimondo Souto, H. Mario, 2007. Motion Picture Photography: A History, 1891-1960. Jefferson, NC: McFarland. Rouve, Pierre, 1986. "Reel to Real: The Cinema as Technological Co-Reality," 85-125, in René Berger and Lloyd Eby, eds., Art and Technology. New York: Paragon House Publishers, an ICUS book. Swartz, Charles S., ed., 2005. Understanding Digital Cinema: A Professional Handbook. Amsterdam & Boston: Focal Press. Viera, John David, Maria Viera; with the collaboration of Patrick Van Osta, 2005. Lighting for Film and Digital Cinematography. Wadsworth Series in Broadcast and Production. Australia & Belmont, CA: Thomson Wadsworth. Wheeler, Paul, 2005. Practical Cinematography. Oxford & Boston: Elsevier/Focal Press. Willis, Holly, 2005. New Digital Cinema: Reinventing the Moving Image. London: Wallflower Press. All links retrieved February 22, 2017. Cinematography Mailing List (the CML) home page. This page was last modified on 22 February 2017, at 17:31.